I’ve been having a great week off the day job, doing just Libro work. I’d like to be able to do this all the time, but really late August / early September are my peak time during the year, with loads of Masters dissertations to proofread, all with similar due dates. Although I’ve had a couple of longer jobs, and one big project from a repeat customer, it’s mainly been 2-4 hour jobs, and lots of them. Two problems – when to do the work, and how to know whether I can take on another piece of work from someone who just emailed me. Ladies and gentlemen: I give you the Gant Chart. I haven’t used anything fancy, just Excel. No project management software, although I’m sure you could use that if you want, and that’s where I got the idea from. But one of my rules is to keep it simple. A phone that phones, texts, and yes, now accesses my email. A computer and an email account. A spreadsheet with my accounts. And an easy gant chart. So – dates across the top, one per column. Customers down the side. And you get to COLOUR IN SQUARES! Yes, it’s like O-level revision all over again – most of the time spent colouring in and underlining, some of it spent working. When a customer books in, I colour in the squares for the days from when they intend to give me the document to when they need it back. In grey. It’s pending. It’s not here yet. But I can see what I’ve got hovering. The document comes in – and it gets coloured in red. Maybe the submission date gets moved, maybe the end date. Now I know what I have in hand – what I have to do. At this point, I shuffle all the rows round so the clients are in order by due date. This way, when I’ve got a lot of work in, I know what I need to do first. 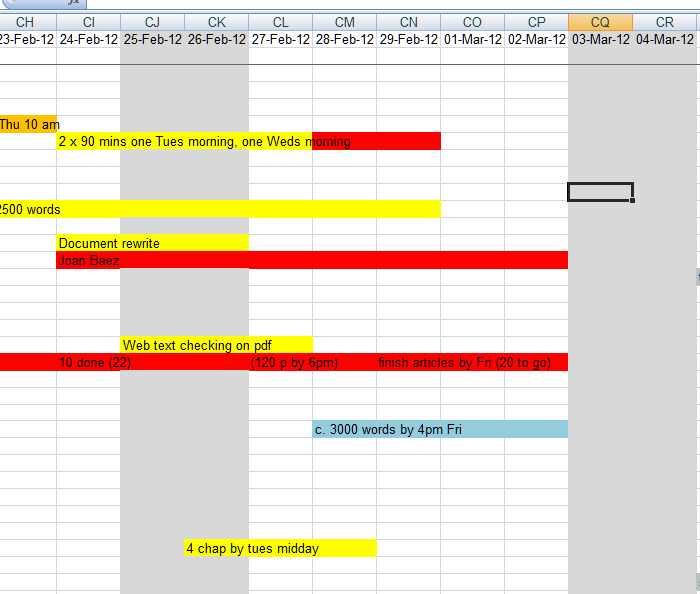 Work done, I write DONE in the cells for the days on which I actually did the work, and colour it in yellow. Invoice submitted – orange. Invoice paid – green! And I leave it on there, to show me what I’ve been up to. A hint: freeze the panes on your spreadsheet so you can see all the client names but move across the dates without losing them. Along with email folders for all my current and completed customers, this has kept me organised over the past few weeks. I hope it’s helped some readers with some ideas. Maybe you’d like to tell me your favourite organisation tip? I actually did my first piece of work for Libro on 28 August 2009, but I registered the company with the Inland Revenue just before that and had a start date of 01 August. So, Happy Birthday Libro! What have I learnt in this first year? I’m proud that I’ve done it – I’ve been paid to do what I’ve done for people for free in the past. I’ve been successful in my work and gathered lots of lovely references. I’m confident working in different versions of Word and with pdf annotating software, and I’ve worked on lots of different projects, from Masters dissertations through PhD theses, non-fiction books and articles, novels, marketing materials and websites. I’m particularly proud that I’ve helped people whose English isn’t their first language to express themselves. I’ve been able to aid the creativity of others by ensuring the infrastructure of language and grammar was there to support their work. I’ve kept to my principles, turning down work that wasn’t right for me, and continuing to do a little bit of free work for charity. OK, the housework and reading might have suffered a bit, but I don’t think my relationship and friendships have, and I’ve enjoyed what I’ve been doing, which I think is the main thing! Thanks to all my clients who have sent work my way and given me lovely references. Here’s to the next year of Libro!